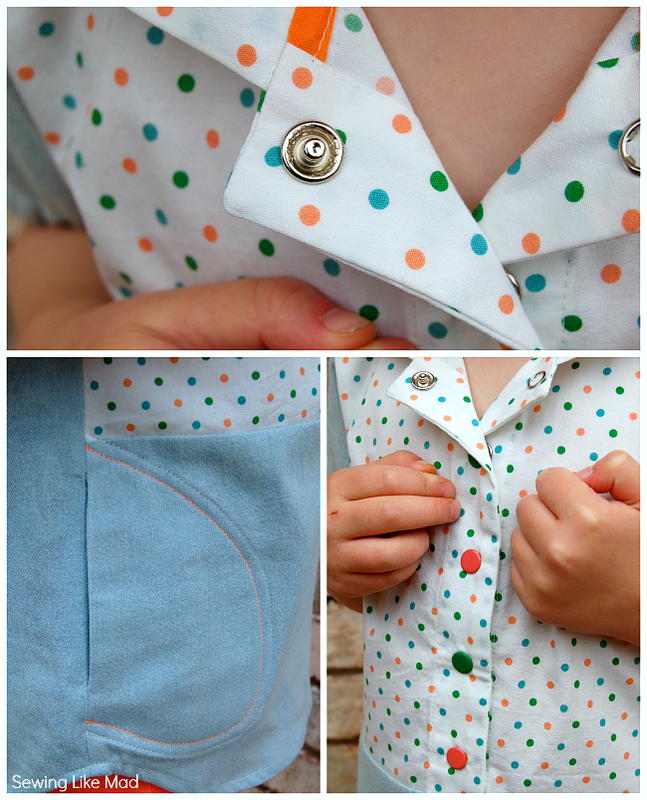 Sewing Like Mad: The Mulberry Tunic by willow & co/Kid Approved. 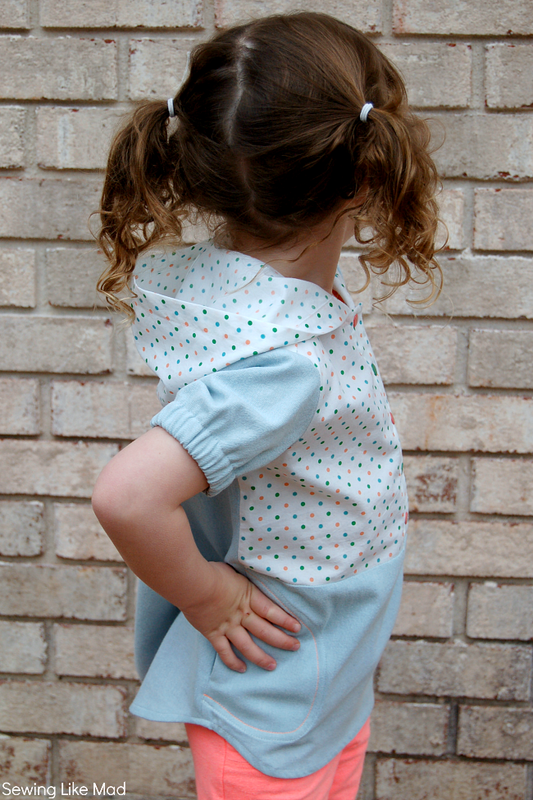 The Mulberry Tunic by willow & co/Kid Approved. 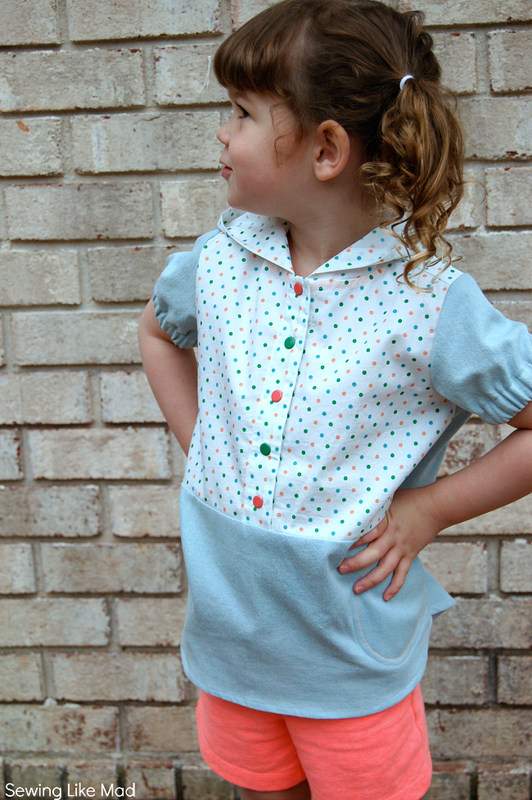 Today I have the original version of the Mulberry Tunic from willow & co/Kid Approved on the blog. You can see my slightly remixed version HERE. 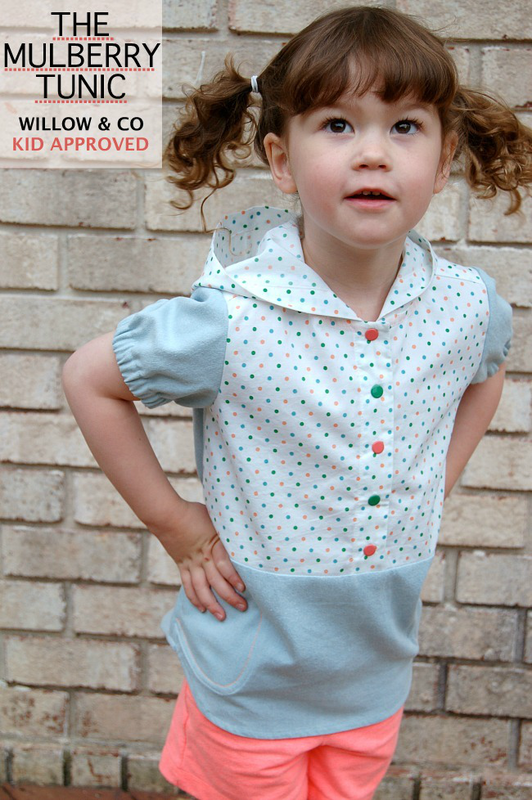 Olga from Kid Approved who designed it, originally made it for boys but it turned out to TOTALLY work for girls too. The only change I have made here is to pull some elastic through the hem of the sleeve because that always adds an extra girly dimension without having to change anything in the pattern. 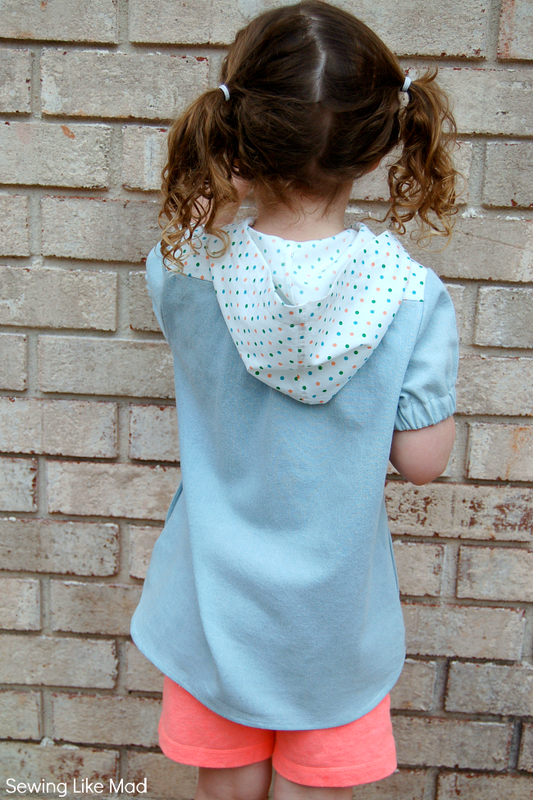 I had no doubt that I wanted to use the hood option, and the in seam pockets are always popular with my kids too. Sometimes two hands are just not enough compared to all the little things kids wants to drag around. I love the narrow back yoke that screams for color block. Here are a few shots of the awesome details. The neck seam is beautifully hidden with a binding....AND you can do the stitching for the front placket and neck in one go. I stitched down the in seam pockets and played around with different thread colors. And then I added some playfulness with two colors of snaps to match the dots in the fabric. And where is the chest pocket you might ask? Ehhhh, I forgot....yup, no fancy design solution or anything like that, I simply forgot to sew it on. You can see many more versions of the Mulberry Tunic in THIS post on willow & co's blog. When you are over there please notice how insanely versatile the pattern is. From dress up style to everyday play and school style. I have so many plans for this pattern. The next version is definitely going to be remixed into a dress. And you can buy the pattern HERE. I love your version, Mie! Your finishings are so perfect... My next version is going to be for my little man and then I'm planning to make it a dress too for my girls - I had this idea as soon as I saw the pattern in the testing period, I think it will make a great everyday play dress. That's so sweet. I love what you've done with the snaps down the front. I just got this pattern and I'm excited to try it out. I love having patterns for woven shirts, I tend to usually stick to knits. Thanks for the inspiration! I love it Mie! Evelyn is the cutest. This was the first Mulberry sewn not by me, so it has an extra special place in my heart. Also, it uncovered a few things that needs to be changed, but let's not talk about that. LOL. As always your workmanship is impeccable. You're so right, elastic on the sleeves instantly makes it more suitable for girls. Genius!